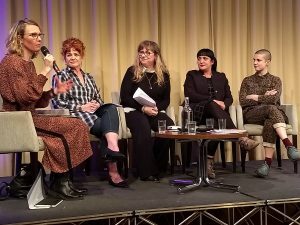 Debbie, FTWW’s founder, and CEO, was recently invited to be part of the panel at ‘Welsh Women For Change’, an International Women’s Day event, hosted by Women’s Equality Network Wales (WEN Wales) at Theatr Clwyd, Mold, on the 20th March. It was an evening of discussion and celebration, hearing from incredible women driving change in the local area! We’re really pleased to be able to share with you her excellent speech! Thanks to WEN Wales for organising, the other inspiring women who took part, and to Wrexham One World Community Choir for the uplifting entertainment!